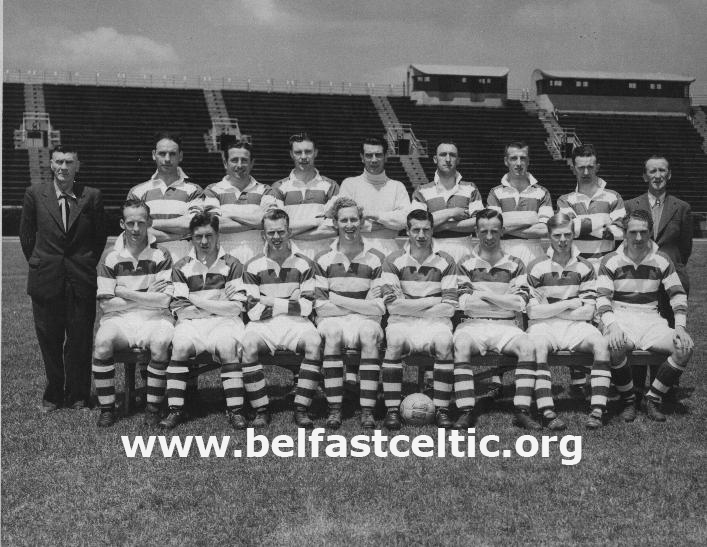 One of the last surviving links with Belfast Celtic's triumphant 1949 team, which felled Scotland in New York, has been lost. Dr. Tom Dorman, a popular member of Elisha Scott's final ever squad, recently passed away. Joining Belfast Celtic in the wake of the infamous St Stephen's Day fixture of 1948, Dorman came from Newtownards and swapped rugby for Irish League football, where he was spotted by Belfast Celtic playing for Ards FC. A fashionable inside left, Dorman starred in several games on the final tour in the USA and played a pivotal role in the great victory over the British champions of the time. Johnny Campbell scored the opener in the Scotland match and the official record of the game records that; "Two more long kicks brought the ball in front of the Scot's goalie and Campbell headed the ball past Jim Brown's outstretched fingers after receiving a pass from Tom Dorman." The second goal of the victory was slotted away by Derryman Alec Moore, a great friend of Dorman's and indeed his room mate on the trip. They spent much time together visiting friends and family in the USA while on tour, sampling the nightlife of the Big Apple and the cafes and speakeasys along Broadway. Indeed, in his tremendous diary of the trip, Alex Moore's Almanac, 'Lexy' records their trips to the Paramount Theatre and their constant flits to restaurants and eateries, while a ferry trip across the river to the Palisade Amusements saw the pals take their very first ride on a rollercoaster! Not just close friends off the park, they were great team mates on it. On Saturday, May 14 1949, in the game against Ulster United in Toronto, Moore replaced Dorman at inside left as Celtic ran out 5-0 winners, in what was described as a 'Stroll in the Sunshine' in Canada. Dorman scored one of the goals, along with a brace from George Hazlett and singles from Mick O'Flanagan and Johnny Campbell. Next day, Belfast Celtic were in the Irish enclave of Kearney in New Jersey for the match against New Jersey Stars. Moore crerated chances for both Campbell and Dorman to score a goal each - before scoring one himself to top the cake in a 3-0 win. The New York Times reported that, after a close first half; "The second half had been under way only four minutes when Dorman negotiated a dandy cross by Moore" which increased the visitors lead to 2-0, in front of 8,500 fans at the Kearney High School field. But the crowning game for Belfast Celtic was undoubtedly played out in front of 15,000 fans at the Tribourough stadium on Randall's Island in New York on May 29 1949 - the game against Scotland that still echoes down the years. Tommy Dorman played his part and left an indellible mark on Irish sporting history and as the team were feted in Belfast on their return and the players began to plan lives away from the Donegall Road, Dorman would move into forensic psychiatry, living and working in England. Belfast Celtic remained close to his heart and he was an Honourary Life Member of the Belfast Celtic Society, carrying membership card number 1020. On a recent holiday in Spain, Tommy died suddenly, but his impact on Irish sporting glory will never be forgotten.